Today, Azerbaijanis celebrate the Earth or Last Tuesday (Torpag or Ilakhir Chershenbesi) prior to the Novruz holiday to be held on March 20-21. Four pre-holiday Tuesdays of Nowruz are Su Chershenbesi (Water Tuesday), Od Chershenbesi (Fire Tuesday) Hava Chershenbesi (Wind Tuesday) and Torpaq Chershenbesi (Earth or Last Tuesday), and each them is dedicated to the awakening of one of the natural elements. According to beliefs, when Earth Tuesday arrives, the soil is ready for sowing, and seeds may be planted in the soil. Samani, the symbol of awakening nature and greenery, is placed on tables. On the Last Tuesday of Nowruz people of all ages and genders must jump over a bonfire. During the Earth Tuesday a holiday table is set, baked goods are prepared and round copper trays “Xoncha” are assembled. “Samani” is placed in the middle of the “Xoncha” with painted eggs, walnuts, hazel-nuts, almonds and sweets decorated around it. According to beliefs, everyone must celebrate the East Tuesday at home otherwise they will celebrate Nowruz away from home for 7 years. 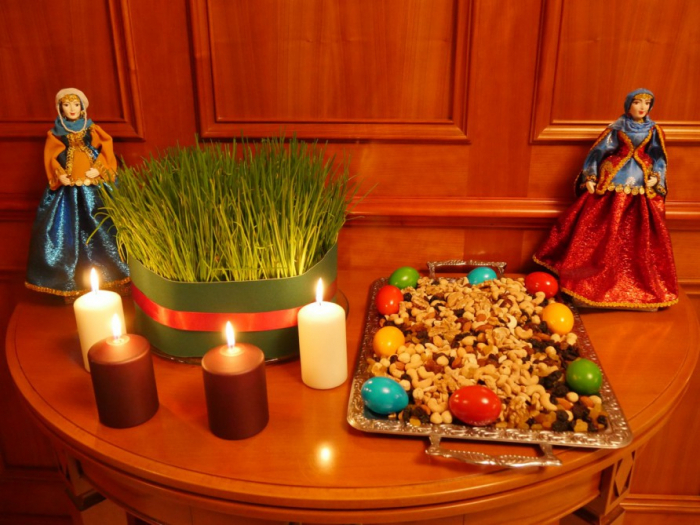 The first Tuesday of Nowruz - Su Chershenbesi (Water Tuesday) was celebrated on February 26, Od Chershenbesi (Fire Tuesday) on March 5 and Yel Chershenbesi (Wind Tuesday) on March 12.